Fire Resistant Bags - Otco, Inc. Fire Resistant Bags - Otco, Inc.
Fire Protecting locking bank bags for important documents, valuables or currency. 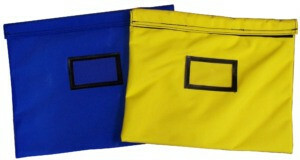 In the event of a fire, these fire resistant bags will guard against damage until the contents can be safely retrieved. New Silica cloth fire material can withstand temperatures up to 2500° Fahrenheit. What does melting temperature of 2500° mean? It means OTCO’s fire resistant bags that can withstand nearly 2500° Fahrenheit of fiery heat for up to 15 minutes ensuring fire protection for your valuables. Fire Resistant Bags – Inter-office mail bags are great for safeguarding documents or small objects from fire. Made out of either Laminated Nylon or 1000 Denier Nylon. Bags come standard with durable metal zipper with pin-locking pull allowing contents to be secured with a removable padlock. Velcro flap over the top of zipper allows maximum fire resistance. 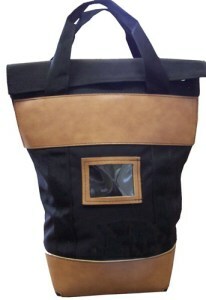 Webbed handles can be added around bag for carrying ease. Fire Resistant Bags – Fire Night Deposit bags come with the same durability features as standard night deposit bags but can now protect valuables from fire. Made out of your choice of Laminated Nylon or 1000 Denier Nylon and have a built-in pop-up lock which is riveted to the bag and completed with a heavy duty security patch. Upping the security by adding Silica cloth fire resistant material to withstand melting temperatures up to 2500° Fahrenheit. 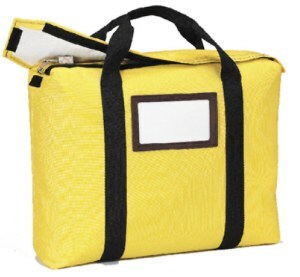 Fire Resistant Night Deposit Bags can be made with or without handles for ease of carrying. Fire-Resistant Briefcase Bags gives a fire bag added depth allowing larger items to have added protection from fire. Made out of your choice of durable Laminated Nylon or 1000 Denier Nylon, durable metal zipper with pin-locking pull tab allows contents to be secured with a removable padlock. Velcro flap over the top of the zipper allows maximum fire resistance. 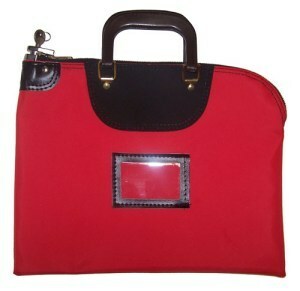 Durable black webbed handles around bag allows ease to carry documents. Fire-Resistant Locking Courier Bags come with the same durability features as the standard locking courier bags but now has the added protection from fire. Made out of durable 1000 Denier Nylon (or Basket Weave Nylon), durable tuff hide trim to increase longevity, built-in pop-up lock riveted to bag as well as durable webbed handles that could carry a thousand pounds along with fire material Silica cloth. Added Velcro flap over zipper and lock adds additional fire protection. Locking deposit bags come standard with high security built-in pop-up lock. Each lock comes with two keys per lock. Bags can be keyed alike, keyed different or master keyed. All fire resistant locking bags are custom made in the USA with hundreds of options of size, material, color, lock, and can be personalized with company name or logo.